Create your own HP LaserJet 8500 color toner pack / bundle with our flexible quantity discount pricing. Mix and match products so you are only purchasing what you need, but also maximizing your savings. Remanufactured Cyan Toner Cartridge with 8,500 page yield. Equivalent to HP part number: C4150A. Fits the following model(s): HP 8500, HP 8500N, HP 8500DN. Remanufactured Magenta Toner Cartridge with 8,500 page yield. Equivalent to HP part number: C4151A. 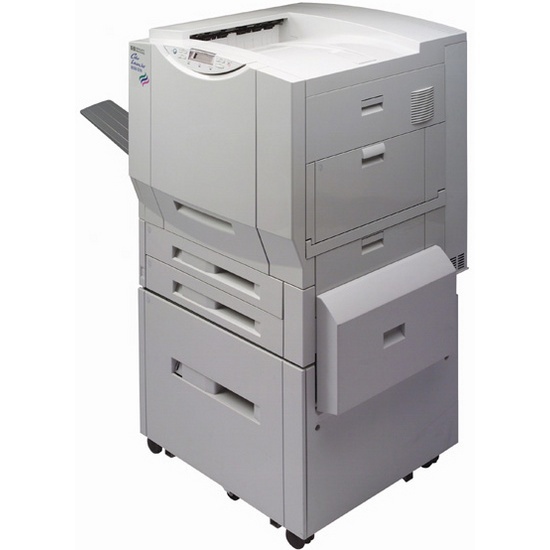 Fits the following model(s): HP 8500, HP 8500N, HP 8500DN. Remanufactured Yellow Toner Cartridge with 8,500 page yield. Equivalent to HP part number: C4152A. Fits the following model(s): HP 8500, HP 8500N, HP 8500DN. Remanufactured Black Toner Cartridge with 17,000 page yield. Equivalent to HP part number: C4149A. Fits the following model(s): HP 8500, HP 8500N, HP 8500DN. Buy our high quality compatible toner for HP LaserJet 8500 with confidence. Join thousands of happy customers who have found our compatible products are equivalent in page yield and print quality. For our compatible products, we offer a 100% Satisfaction Guarantee allowing you to return products within 6 months if you are unsatisfied. When you have a lot of users to support, a small laser printer just won't do. The HP LaserJet 8500 is a color laser printer with the speed and paper capacity to support a large office without sacrificing on quality or features. Although its upfront price is high, the savings on printer toner in the long run will help defray costs because HP 8500 toner is very affordable. Paper handling is a major feature for the HP 8500, as it features two 500-sheet trays to ensure that even the largest office does not have to replenish often. Obviously, because of its large capacities, the unit is quite large. It won't find a place in a home or small office, but its performance justifies its bulk. The 8500n is the base model with networking, but the 8500dn also adds automatic duplexing. While the machine supports only 600 dpi resolution, HP's ImageREt technology offers enhancements that can simulate a 2400 dpi printer for extra sharpness. It is unclear how much this is achieved, but prints definitely look sharp. Shopping for low-priced HP toner is easy, as HP 8500 toner cartridges are widely available, being some of the most popular on the market. In fact, their popularity makes it easy to find compatible LaserJet 8500 toner cartridges for a fraction of the price of OEM HP 8500 toner. Sharing one printer among a large number of users is a daunting task, but HP has answered the call with excellent management software built right in. It is easy to manage users, restrict access when necessary and track usage statistics, and setting up network sharing is a quick and simple process. For the high-volume large office environment that needs a solid and reliable network printer, the HP LaserJet 8500 makes an excellent choice. Its print speeds are fast, color output is impressive, and the cost of LaserJet 8500 toner will make up for its high upfront cost in the long run.